Dentistry and modern science have not been able to find a cure for the occurrence of tooth decay, gum disease or oral cancer. Tooth decay is the most common disease in man, 30 percent of Americans have advanced gum disease, and oral cancer is epidemic. Today’s dental mission should not be just reacting to problems; instead the priority should be in prevention. Q: What can I do to prevent tooth and gum disease? A: Everyone has bacteria in their mouth. These bacteria form a plaque on teeth (sticky bacterial deposits). To prevent tooth and gum destruction, you must remove this acidic bacterial biofilm. This is done by daily brushing and flossing. Brush at least twice a day. Floss once a day. The use of anti-cavity fluoride toothpaste and treatment gels aid in limiting the acid effect on tooth enamel. Regular dental examinations and professional cleanings remove plaque and calculus (mineralized plaque), administer fluoride varnish treatments, allow for caries to be treated early with fillings and treat early gum disease. Dental sealants (plastic protective coverings) can be applied to the biting surfaces of back teeth. These seal the grooves where almost 90 percent of decay occurs, preventing decay from occurring when in place. Sealants need to be placed before decay occurs (around 6 and 12 years of age when the permanent molars erupt into the mouth). A: Periodontal disease is an infection of the tissues that surround teeth. It is caused by the accumulation of bacteria (long term plaque). It’s progressive, causing the structures that support teeth to break down (gums, jaw bone and attachment to the roots). As gums are damaged, pockets develop around the teeth. Untreated, more gum is destroyed and infection spreads down the roots to infect bone. Even healthy teeth become loose, fall out or need to be extracted. Periodontitis is the primary cause of adults losing their teeth. Gingivitis is the milder and reversible form of periodontal disease. There is no bone loss yet. Treatment is aimed to kill bacteria, reduce pockets and repair the damage and regenerate bone and attachment tissues. Q: How prevalent is oral cancer in the United States? A: Over 30,000 new oral cancer diagnoses were made last year (2 percent of all types of cancer). Persons with a previous history of oral cancer and combination tobacco and alcohol users over the age of 40 are at the highest risk. However, oral cancer is universally found in persons of all ages and backgrounds. Every person should undergo routine visual oral cancer screenings. In this country, the responsibility of oral cancer screening has fallen on general dentists. Every dental patient should undergo an oral cancer exam at every dental examination visit, consisting of a routine visual screening and palpation of high-risk areas. The earlier a cancerous lesion can be detected, the earlier it can be treated. Earlier treatment relates to a higher cancer victim survival rate. 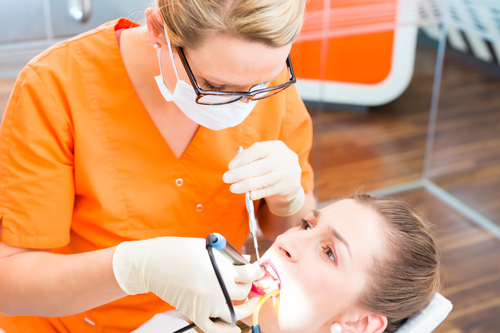 Dental diseases are not completely preventable. No vaccine is available to prevent these common diseases. Without a cure, utilize the modern dental technologies for maximum prevention and limit destruction with early treatment.